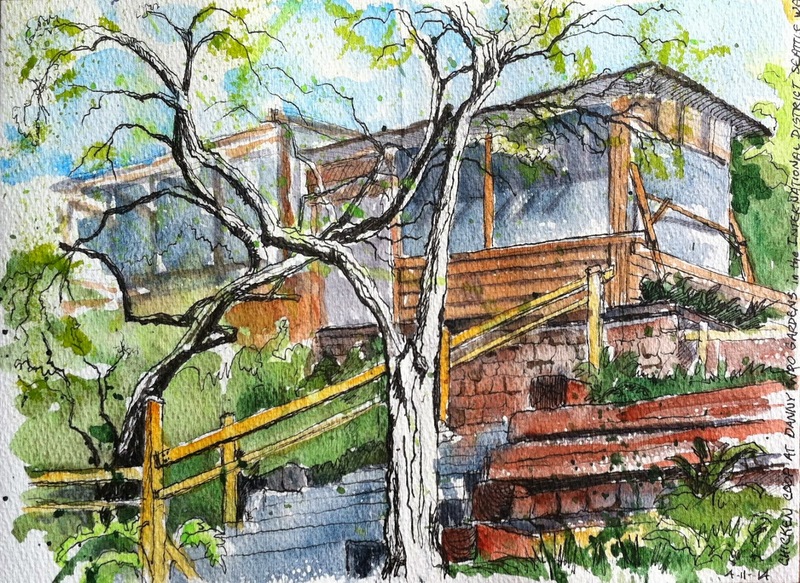 Urban Sketchers Seattle: A TREASURE in the International District!!! A TREASURE in the International District!!! The Ad Hoc Friday Sketchers met at thew Panama Hotel in the International District today, But before I went inside, I crossed the street, and discovered the Danny Woo Community Gardens of the I.D. It was amazing!! Many terraced levels full of quaint and funky gardens, stairs, bluebells, and many old cherry and apple trees, full of blossoms. Up and up and up I trekked, marveling at the uniqueness of these gardens. Near the top, where it levels out a bit, was a great chicken coop (pictured above), and then so much more in the "P-Patch" area of this garden. Panoramic views over to King Street Station, as well as the Smith Tower were tempting, but, first I checked in with everyone, and told them about my "discovery" outside in the partly sunny no-rain day!! I guess the Panama Hotel Tea Room will have to wait for another day - and I WILL go there, because it is ALSO full of character and coziness. Your sketch has a solidity and structural integrity that I love. A wonderful drawing. It would be hard to stay in the Panama Hotel on a sunny spring day:) This is a great sketch. I love the twisted trees against the geometry of the chicken coop.